Whether you are putting down a new pavement on an existing pavement or multiple layers during new construction, it is vital to have the layers fuse together to perform a single layer to distribute the stresses and strains that today’s heavy traffic places on our roads and highways. Conventional tack (bond) coats take time to cure and when they do, they often track from where it needs to be to the tires of traffic and construction equipment and onto other pavements. There needs to be a faster breaking and quick curing tack (bond) coat that once it is cured does not track. ULTRAPAVE® has developed a REDUCED TRACKING TACK COAT ADDITIVE, UP 1010, that when added either to an anionic or cationic emulsion that has been optimized for fast breaking and quick cure will provide a Reduced Tracking Tack (Bond) Coat. ULTRAPAVE® ‘s UP 1010 is a blend of select latex polymers especially formulated as a modifier for asphalt emulsion systems used for tack/bond coats. UP 1010 is an effective additive to reduce tracking of an optimized tack/bond coat. Its use in bond (tack) coats formulations improves bonding of the new asphalt layer to the existing pavement layer. The use of UP 1010 in these formulations can assist in reducing the tracking of the applied tack/bond coat prior to new pavement placement. UP 1010 will allow you to use similar asphalts that are used for conventional Tack (bond) coats but without the tracking. UP 1010 may be added to the anionic or cationic asphalt emulsion at the time of emulsion manufacture either by adding to the solution or by direct injection into the solution line; or post adding to the finished emulsion. 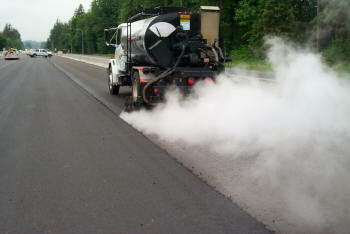 The typical formulation will contain 4 – 5% active polymer by weight of asphalt residue. Customers must conduct their own evaluations to verify and optimize performance. UP 1010 lends itself to easy handling, pumping and storage. Contact your ULTRAPAVE® Representative for specific information on your applications.